My housing cooperative in New York City used to have a cooperative supermarket and credit union, which both closed decades ago. Here I explore their history to find out what happened with these organizations. In those years there was a network of food coops associated with housing coops in the city. Can we re-establish this historic connection? This is adapted from an article I wrote for the Morningside Gardens News, the monthly newsletter of my housing cooperative in New York City. Morningside Gardens was established in 1957 and is located in the Morningside Heights neighborhood of Manhattan. It has six 21-story buildings with almost 1,000 apartments and leases a number of retail stores along Amsterdam Avenue where the coop supermarket was located. In the course of doing this research I found that there was a network of housing cooperatives in New York City that also had food cooperatives. In addition to my coop, this included stores at the Amalgamated, Co-op City, Esplanade Gardens, Penn South, and Rochdale Village housing cooperatives. These stores have all closed, but can we bring them back and re-establish this historic connection? We Had a Food Coop? Several national food retailers expressed interest, but in the end it was decided that a cooperative market was an appropriate choice, after a poll was taken of the people who were soon to move into Morningside Gardens. Mid-Eastern Cooperatives, the company chosen, operated large markets in many parts of the country at the time, and already had a smaller store in the neighborhood. I’ve been a member of food coops in the past and was curious about this. Then more recently, in the interviews of original residents of our coop featured in the Morningside Gardens News (News) in 2017 and 2018, several mentioned shopping at or being involved with the coop supermarket. I wanted to find out more and started reading all the old issues of the News, which had a lot of information. From the time the supermarket opened in 1958 until it closed in 1991, there were over 150 articles about the store, as well as advertisements in nearly every issue. And to my great surprise, I learned that we also had a credit union from 1965-1980, which I had never heard about, with the News including nearly 30 articles about it. As I was reading, I decided to tell the story of the coop store and credit union so current Morningside Gardens folks, and the larger cooperative community, could better understand these important chapters of our history. Along the way I encountered a number of other organizations that revealed the wider cooperative universe that existed at the time. I’m also wondering if we could revive the coop store someday, but let’s learn about what happened first. 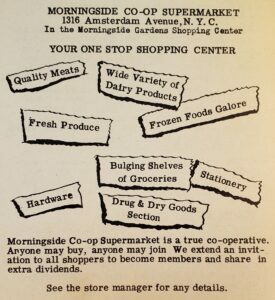 The coop store incorporated in New York with the name Morningside Heights Consumers Cooperative in April 1957. 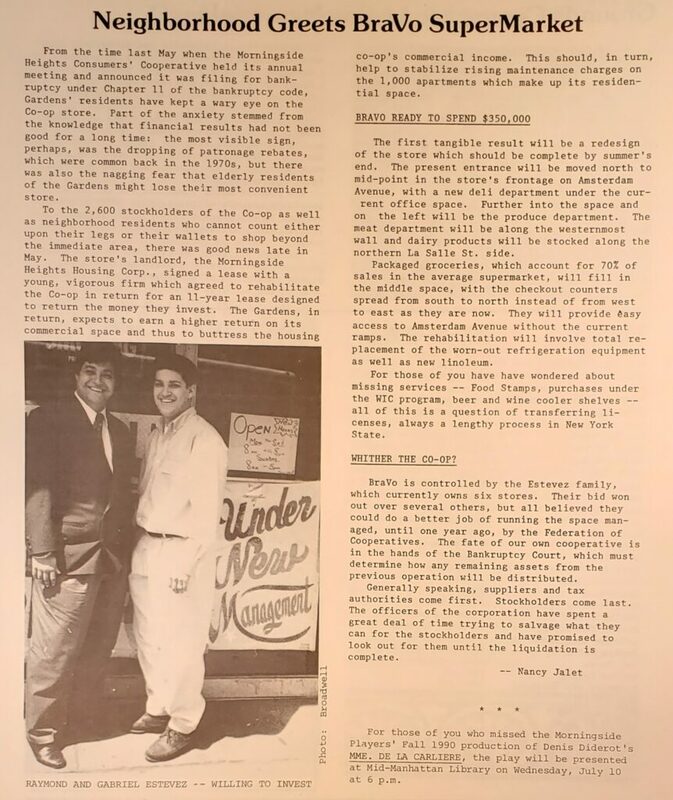 The first News article I found about the market was in the March 1959 issue which reported on the first full year of operations in which the store had over $1 million in sales. The store started out with 400 members who purchased shares. A 1960 coop store News advertisement mentioned different types of “CO-OP Label” products for different budgets – Deluxe, Red, Blue and Green. Another advertisement later that year had more information, “Co-Op label products meet high standards set by National Cooperatives, Inc., central purchasing, manufacturing, and merchandising services for Co-Op stores.” Thus there was a network of coop stores supplied with coop labeled goods by National Cooperatives. The Morningside store was originally managed by Mid-Eastern Cooperatives, which had its headquarters and warehouse in New Jersey. But shareholders soon took control of the store. 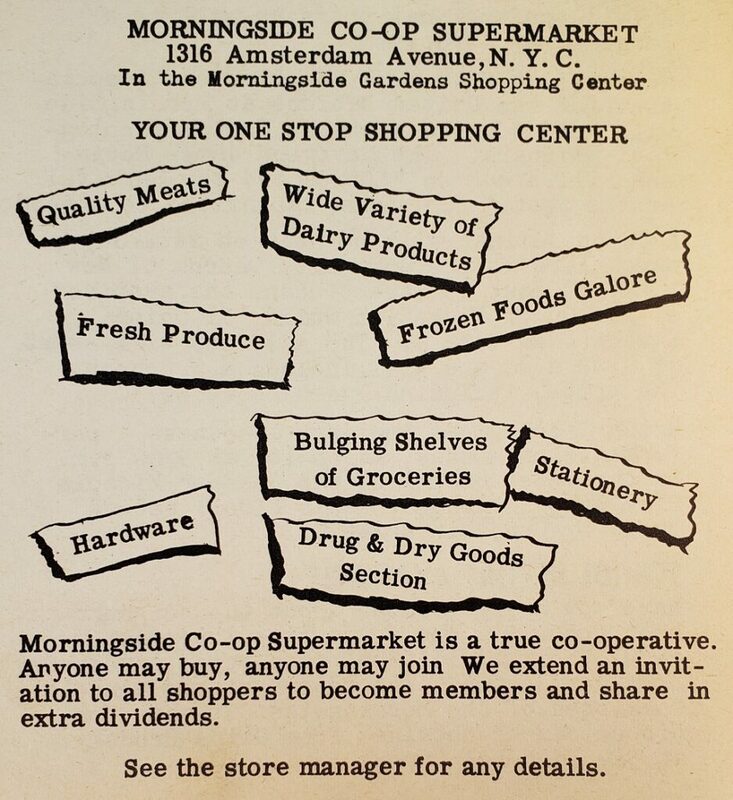 A 1962 News article reported on a special coop store meeting “…to inform members of developments of our efforts to take over control of operations.” Control by Morningside coop store members was established later that year. 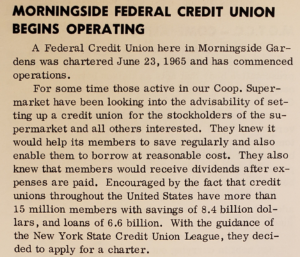 In 1965 the coop store helped start the Morningside Federal Credit Union so that members would have access to loans. The credit union operated in an office in a Morningside Gardens building. After more than a year, it had a membership of 105 and had made 35 loans, and at the end of the decade it had over 150 members. 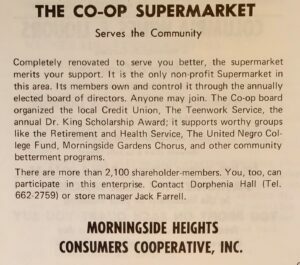 In 1967 the coop store helped provide technical and financial assistance for a new market called the Harlem River Consumers Cooperative, which opened in 1968. This was located at another housing cooperative called Esplanade Gardens at 147th and Seventh Ave (now Adam Clayton Powell Boulevard). Throughout the decade, our coop store grew in sales and members and made a profit in most years. Articles in the News reported nearly every year on the annual meeting in May where the fiscal results were announced. In 1964, the store had 900 members, by 1966 there were 1,700, by 1967 there were 2,000 members, and it ended the decade in 1969 with 2,100 shareholders. In most years, the store would give out a “patronage” or “sales rebate” of a few percent. Members would turn in their receipts for the year and the rebate was calculated based on how much they spent. The store also sometimes paid members a dividend of about 5 or 6% for each $25.00 share they owned. You didn’t have to be a member shareholder to shop at the store, but only members could run for the Board of Directors or hold other positions, vote at the annual meetings, or receive the rebates and dividends. The three highest annual rebates ever reported by the News, 6%, 4.6%, and 4.4%, all occurred during this successful decade. The decade started out strong with 2,200 coop store members, almost $1.9 million in sales, and a patronage rebate of 3.7% in 1970. One article that year mentioned that two-thirds of sales came from members. In 1971 the News ran several complaint letters from store customers, and the board of directors realized they needed to improve the store. 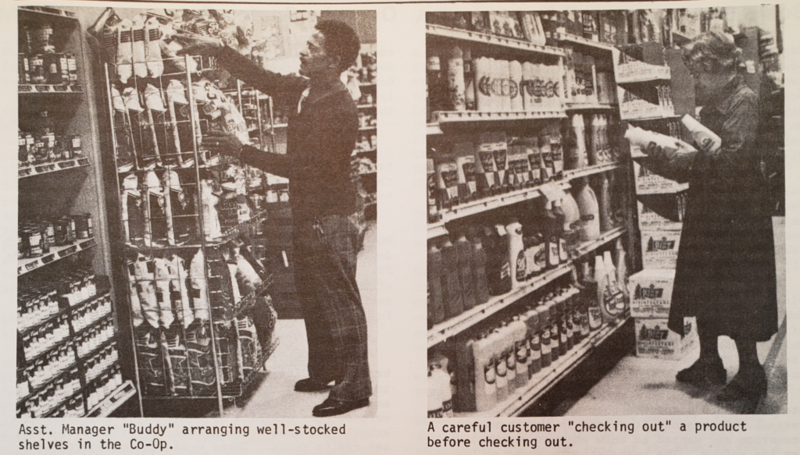 In 1972 they undertook a major renovation, including new shelving, check-out counters, tile floor, frozen food cases, dairy cases, air conditioning and lighting. The store had its grand reopening in October after the renovations and the December Security Report in the News stated that “guards broke up an attempted hold-up in the Co-op Supermarket.” In 1974 after the renovation, the coop store ran new advertisements in the News, reminding members of the store’s contribution to the community and calling for increased patronage. In 1975 the credit union had its 10th year of operation and over 200 members. There were discussions about merging with the Church of the Master Credit Union, which was associated with a nearby church. The next year the credit union announced it was working in partnership with the Sixth Avenue Credit Union, which would allow for expanded services. In 1977 there was news of the retirement of Jack Farrell, the coop store manager for 20 years. Later that year the new manager announced new coop store policies, including expanded hours, more specials and a 5% senior discount. That year the store hit $2 million in sales, about double its first year 20 years earlier, but membership had dropped about 10% to 2000. An article that year by long-time coop store member Justus Poole discussed the early history of the store. 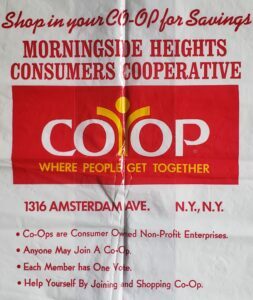 There was a previous coop store in Morningside Heights, called the Morningside Cooperative Society, which was founded in a church basement around 1940 and moved to the northwest corner of Amsterdam Ave and 122nd St. Poole’s article also mentions several other coop stores that went out of business and that competition among supermarkets in the 1970s turned brutal. Elsewhere in that News issue was a report of the famous July 13th, 1977 blackout when the coop store was broken into but Morningside Gardens security officers arrived and nothing was stolen. In 1977 the credit union reached 300 members and was providing loans of up to $1,000 for education, medical or housing expenses. The credit union had kept its funds at Citibank, and in 1978 the Citibank branch opened at Morningside Gardens, which is still there. After many tough years, the coop store finally made a small profit again in 1978. There hadn’t been any rebate mentioned in the News since 1970. In 1979, results were even better, as the store finished the decade with sales of about $2.5 million, a profit of $54,000, and a rebate of 2%. An article also mentioned an ongoing store boycott of Nestle products in protest of the company’s marketing of infant formula in developing countries. In 1980 the credit union was up to 317 accounts. But sadly, the next year the News reported that it had “liquidated” in December 1980. The accounts were transferred to the Sixth Avenue Credit Union. You get the sense from News articles that the credit union had struggled to find members and was unable to offer large enough loans or other services. I interviewed Morningside Gardens resident Merryl Sheldon, who was the last credit union board president, about the final years. She described how they would conduct business in an office by one of the building lobbies where members would deposit money and apply for loans. She said “we were giving loans to people who couldn’t get loans at a regular bank and were fulfilling a real need.” But she also described problems with unpaid loans, saying “we had some bad loans because some people borrowed money and didn’t repay their loan.” After 15 years of operation, this ended the Morningside Federal Credit Union chapter of Morningside Gardens history. The coop store had another profitable year in 1980, and a new store manager. However, the next year was even better. In 1981, the store announced record sales of over $3 million, which was about triple the sales of 1958, its first year of business. The store also had $62,600 in net profit, its fourth profitable year in a row, and one of the highest profits ever reported. Again there was a sales rebate and stock dividend. The store appears to have rebounded from its troubled years in the 1970s. More challenges were ahead though as later that year came the troubling news that Mid-Eastern Cooperatives was going out of business after celebrating its 50th anniversary. The coop store needed a new wholesale supplier, and in 1982 it began working with the Federation of Cooperatives which served nine other coop stores in the city. 1982 was a worse year for the store, with a decline in sales and no dividend or sales rebate. There was also a huge electric bill from Con Ed. A News article explained that the store was under-billed for years because of an oversight during the 1973 renovations when a new higher-voltage meter wasn’t installed. When this was discovered, Con Ed put in the new meter, which doubled the electric bill, and then attempted to collect the back charges of $172,000 all at once. The store challenged that bill in court and eventually settled the next year for $46,700 in total costs. There was a lot of turnover in store managers in that era, and in 1983 the store hired its fifth manager in seven years. That year the store also signed a new 10 year lease with a gradual increase in rent. The News published two photos of the inside of the store, the only ones I ever found. Another article later that year mentioned the renegotiation of the store union contract, the first report in the News that the workers were union members. This was the Local 338 retail workers union. In 1984, an article mentioned that the coop store had helped start the nearby Manhattan Valley Co-op which had opened in 1982. Also interesting was a report that the Morningside Gardens Camera Club had photos on display in the coop store window, an arrangement that continued until the store closed. Another article listed nine coop store committees that needed help (education, finance, store appearance, etc. ), giving a sense of the volunteer effort required to run the store. Unfortunately the store was losing money for several years even though sales rose to a record $3.6 million. A News Security Report mentioned a store robbery, “Co-Op Supermarket manager robbed at gunpoint by a male who handcuffed him in store and stole cash.” In 1985 an article mentioned that the “store is entering a crucial period which will determine whether a store that is customer owned and directed can continue to exist.” At the 1985 annual meeting, a guest speaker discussed how the coop stores in the city had a history of pro-consumer policies and activism and were supporting the New York bottle return law. That year the store brought in yet another manager who implemented improvements in merchandise, store appearance and productivity. There was also a long letter from coop store Vice President Beatrice Gottlieb discussing the danger of the store closing, and that there were a number of low cost competitors that have taken away customers, but that the store was continuing to make improvements. Articles in 1986 reported on improvements with store performance, with a small net profit, but also the sad news of the death of Arthur Katz, coop store board president for the last three years. In 1987, the store requested to be able to sub-meter its electricity from Morningside Gardens to save money on its electric bill, but the Morningside Gardens board of directors refused. A 1987 article urged coop store customers to become members and mentioned several examples of the store’s social responsibility, such as honoring the United Farm Workers grape boycott, avoiding General Electric products, and carrying healthier foods. At the May annual meeting that year, the store announced a profit of $21,000, its best result in five years. For some reason, there was no further News reporting on the store for the next four years. The only brief mentions were a 1989 listing of the store annual meeting in the Community Calendar and a 1990 article on the Morningside Gardens Camera Club photo display in the store window. Then in June 1991 the bad news came in a full page News article that the coop store, with 2,600 shareholders, was filing for bankruptcy and would liquidate its assets. It would be replaced by a Bravo Supermarkets run by Raymond and Gabriel Estevez. That month also had the last coop store advertisement in the News. The coop store’s bankruptcy filing in May 1990 indicated a troubled relationship with the Federation of Cooperatives, stating, “for the last several years there has been dissatisfaction with the services provided by the Federation and the reporting on operations.” The store wanted to continue operating, declaring that the “Debtor desires to continue the operation of the business and management of its property…and intends to propose a plan of reorganization pursuant to the provisions of Chapter 11.” That plan never worked out as the store continued to lose money throughout 1990. Morningside Gardens and the coop store held discussions with several companies to buy the assets of the store and take over the lease. This resulted in a deal with the Estevez family and an 11 year lease to Bravo Supermarkets. Bravo lasted for 5 years until 1996 when they replaced it with a Met Foodmarkets which is again changing to a Food Town this year. The coop store filed for corporate dissolution in September 1994, so it took several more years to work out the bankruptcy. Why did the store struggle in the late 1980s? Some possible factors that came up in News articles over the years include the shutdown of Mid-Eastern Cooperatives, which led to the apparently troubled relationship with Federation of Cooperatives. There was increased competition from lower cost, non-union stores and the large electric bill settlement with Con Ed which disrupted the finances. There was a rapid turnover in store managers, with a half dozen in 10 years, and the increasing rent that was negotiated in the last lease. Looking at inflation adjusted sales data is also revealing. 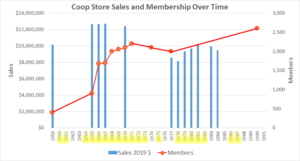 The chart below summarizes the available coop store sales and membership data, and there appears to be a relationship between them. I also highlighted the years where there was some indication of a store profit. The first year sales reported in 1959 were $1.1 million, which is about $10.2 million in 2019 dollars. Sales increased in real dollars throughout the 1960s, which is also when store membership increased dramatically to over 2,000. This was also an era with profits nearly every year. The 1970 sales were reported to be about $12.4 million in 2019 dollars. After that, sales fluctuated at a lower level, dropping to a low of $8.1 million in 1978, and the store also lost members and had several unprofitable years. In the late 1970s, the store then entered another era of increased sales and profits and 1984 is the last year we have a reported sales number of $9.5 million. We lack data on store membership between 1977 and 1990, but we know it increased by 600 during those years and it’s likely that much of that occurred during the second profitable era. So if we assume that members were the most motivated shoppers, it makes sense that the store was successful with growing sales and profits during the years when membership was increasing. I talked with Morningside Gardens resident Beatrice Gottlieb to find out more about what happened. She shopped at the store for many years and also served on the store board and as president in the 1980s. 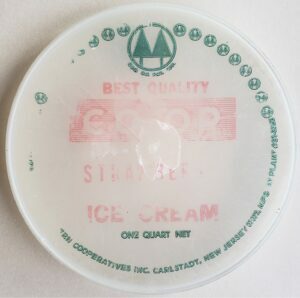 She talked about how the store struggled for years during that time, that they stopped giving rebates in the final years, and that “folks could see the end coming.” Luckily, she had saved a CO-OP label ice cream container top, shown here. I also talked with Merryl Sheldon who was the bookkeeper at the coop store in the 1970s and 1980s. She described a number of problems with mismanagement by the Federation during the final years. They sent several managers who had been at other coop stores, and some of them didn’t work out. She would send supplier payment checks to the Federation but they stopped forwarding them. During the bankruptcy she saw there were boxes of unpaid checks. She also has some interesting memories of the store. Merryl was once in the store with a number of customers when a robbery happened. She was in the Local 338 union and still gets a pension today. When the store changed to Bravo in 1991, she worked for a few months helping with the transition. I’m so glad Merryl saved a coop store shopping bag, shown here. Overall the store had a decent record in a competitive industry. Of the store’s 33 years of operation, the News reported on a store profit, rebate or dividend in 20 of those years. All of the other coop stores mentioned over time in the News have also closed, so there were larger factors affecting all cooperatives. These include the stores at the Amalgamated, Co-op City, Esplanade Gardens, Penn South, and Rochdale Village housing cooperatives in New York City. The Federation of Cooperatives also went out of business in 1991. 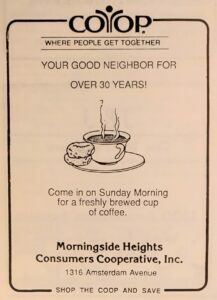 The Morningside Heights Consumers Cooperative and the Morningside Federal Credit Union are fascinating chapters in Morningside Gardens history. It’s an impressive accomplishment for a coop store to serve the community for over three decades, providing good paying union jobs, groceries with social responsibility and assistance to local organizations. The store membership also demonstrated solidarity with the cooperative community by helping to start other nearby coop stores. The store and the credit union show the creativity, ambition and hard work of the many Morningsiders who volunteered to help run these cooperative institutions. I’m in the process of putting together a longer, more detailed history of the coop store and credit union and am interested in any information about them including detailed memories, paper records of any kind (flyers, newsletters, member certificates), or photos (I really want a photo of the coop storefront). I can be reached at edirnbach@gmail.com. Eric Dirnbach is a labor movement researcher and activist in New York City and a member of Research|Action, a research cooperative. He has written for Jacobin, Labor Notes and Organizing Work.